As always, I want to do my best to keep my friends informed about what’s happening with your favorite storyteller. I’m putting the finishing touches on the upcoming 6 week tour of Peru. I’ll talk more on that the closer it gets. I do not have a single day free in February, Black History Month. That, my friends, is a blessing. Any artist working in this day and age, under this economy should jump and shout for joy at being busy. On the 9th of February @ 2:00 pm, I’ve got a performance that I want to invite as many of you too as can fit in. The theatre only has 45 seats. I want this performance to be small, intimate and engaging. I will be pushing the boundaries of my storytelling skills be authoring this “one-man” show. 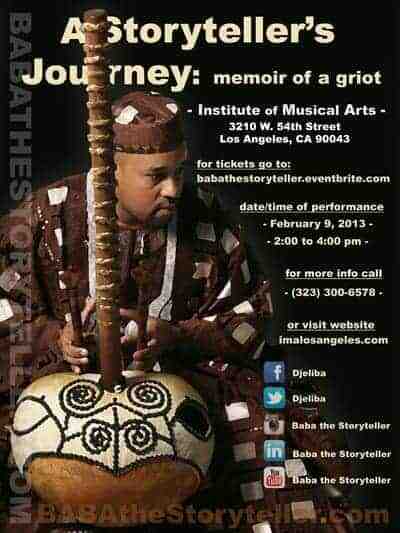 Attached is the flyer for the performance and here’s a link with a little more information. Let me know if any of you will be able to make it. Unfortunately, it’s best to purchase tickets early because of the limited seating. If you’ve got any questions, don’t hesitate to contact me. For those of you who will be coming, I’ll see you there! Once again, as always, I give thanks to each and everyone of you for being willing to be on my email list. I appreciate and respect your support of my work.